The Sisters of the Holy Family of Nazareth have been ministering in the Philippines since 1982. They came on the invitation of the Oblates of St Joseph in Metro Manila. House Blessing December 11, 1982. 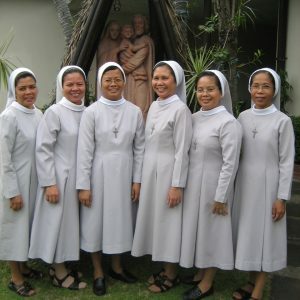 Today of the forty professed Sisters only two are from the United States, the remainder being native vocations. Young girls continue to be respond generously to God’s call. At present there are four novices and four postulants with a good number of girls in the affiliate program in Antipolo. Ministry to the family, characterizes the work of the Sisters who are now spread across four islands, Luzon, Cebu, Bohol and Oriental Mindoro. The Sisters are involved in parish ministry, pastoral care, religious instruction, education at the pre- school, elementary, and secondary levels. The main house of the congregation, Mary of Nazareth Provincialate, is located in Greenhills, Manila. However, this is not only the place where the provincial resides, but it is also home to the local community of Sisters who minister in parishes nearby. Currently, the postulants also live in this local community, taking advantage of the religious formation courses which are readily available in metro Manila. The sisters celebrating with the people. While visiting the local communities it is easy to see that the Sisters are committed to serving God’s people wherever they happen to be assigned. The Sisters are well prepared for their chosen ministries, and most are qualified as teachers, catechists, pastoral care workers etc. Once trained the Sisters move easily and adapt to their local situations be it in a poor or a well-established area. 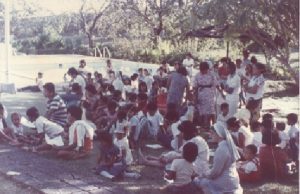 The congregation has two congregationally owned/sponsored ministries, namely, Holy Family School, (Kindergarten to Year 12) Tubigon on the island of Bohol and Holy Family Kindergarten in Antipolo City. In October 2013, Holy Family School Bohol, suffered extensive damage from an earthquake. Nevertheless due to the overwhelming generosity of parishes in Manila, the Sisters and their families from across the globe as well as a grant from Caritas, the building has been restored so that the school is fully operational once again. 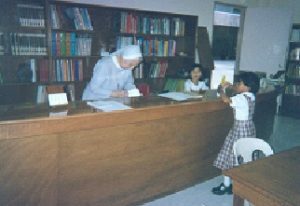 S. M. Irmina working in the school library. A special program for the local children is held at the Kindergarten in Antipolo. It is the ABC Programme for Pre-School children who cannot afford to attend the local preschools. The families do not pay any fees. In addition to this, the Sisters run a Feeding Programme four days week, providing a main meal for under-nourished children in the local area as well as some of the homebound elderly. 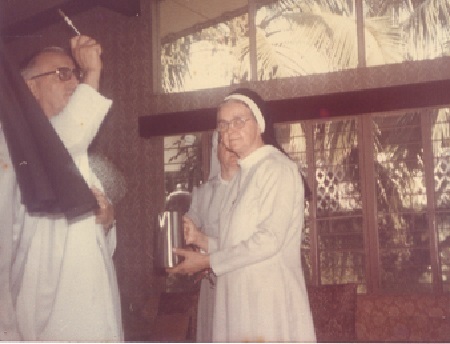 The Sisters also administer a Parish School in Nasugbu, Batangas, Academia De San Francisco Xavier which, while only a fairly new school, enjoys an excellent reputation in the Diocese. S. Janet with some of the boys. 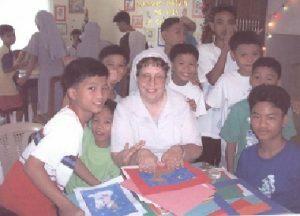 Mercy Halfway House for Boys in Alabang Hills, has been a ministry of the Sisters for many years. Many of the young boys who found not only refuge but also a home with the Sisters are now college or university students, or due to a well-established career are living independently in their own units. The mission of the Sisters of the Holy Family of Nazareth is the mission of the Church. The challenges, joys and blessings are the same. With God’s continued help, the protection of Mary of Nazareth and the generosity of so many people, the mission will continue so that “God’s Kingdom will continue to be established on earth…. in the Philippines. 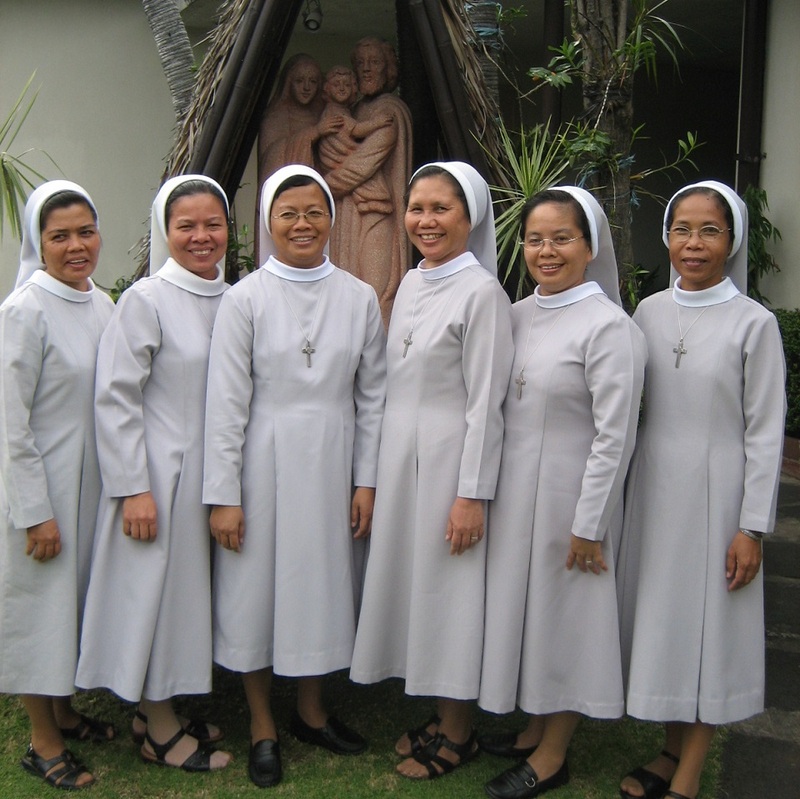 These are six of the seven original Philippino vocations when Nazareth began in 1982. They are, from left, Srs. Julie Marie Catapang, Mary Lyn Panares, Maria Fe Mata, Maria Gloria Tablatin, Judy Marie Balladares and Alyn Marie Calago. Not pictured is Sr. Marisabel Loreto.